Summary: After gaining more than 7% by late January, US stocks have fallen into a 10% correction. It's the quickest decline of that magnitude from an all-time high in 90 years. While a fall in stocks was not a surprise, the speed and severity certainly were. That said, strong down momentum normally reverberates into the weeks ahead. Equities sometimes "V bounce" but more often form a double bottom. A low retest in the not too distant future remains a greater than 50% probability. The longer-term outlook for US equities is unchanged and favorable. 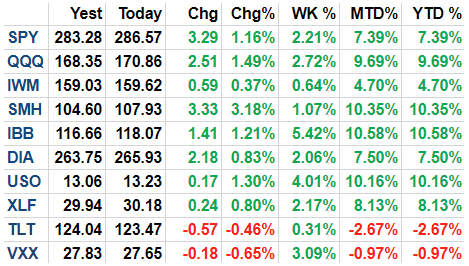 Two weeks ago, all of the US indices made new all-time highs (ATHs). SPX and DJIA were up 7% and NDX was up 10% YTD. VXX, the ETF based on the VIX, was down for the year (the next two charts from Alphatrends). Enlarge any chart by clicking on it. In hindsight, we now know that that was an interim top. 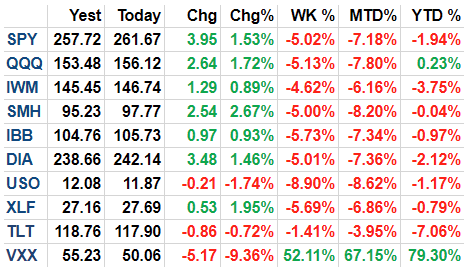 Compare the chart above to the one below: most equity indices have lost 10% in two short weeks. Bonds have tumbled further. Volatility is 80% higher. In the grand picture, a drop of 10% is not unusual, and so the last two weeks are not a complete surprise. 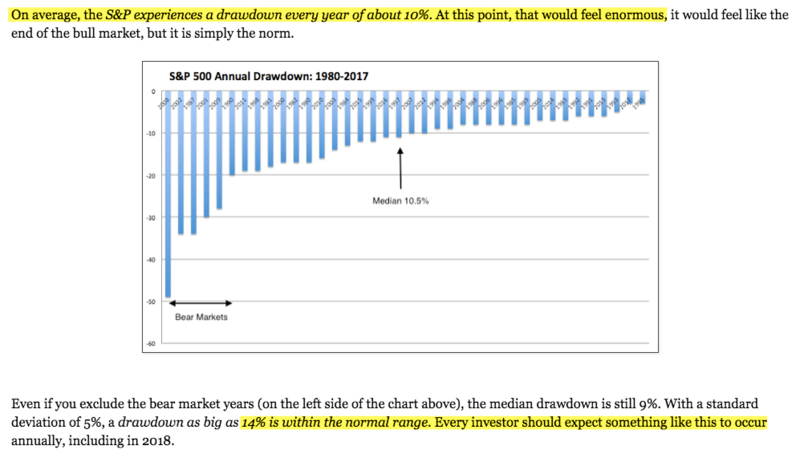 In a post on "What To Expect in 2018" (here), we showed that the median annual drawdown in the SPX has been 10% and that even a 14% fall is within the normal range. And in a post in early January, we showed that low volatility years (like 2017) have always been followed by years with volatility 2-3 times higher (from Ryan Detrick). 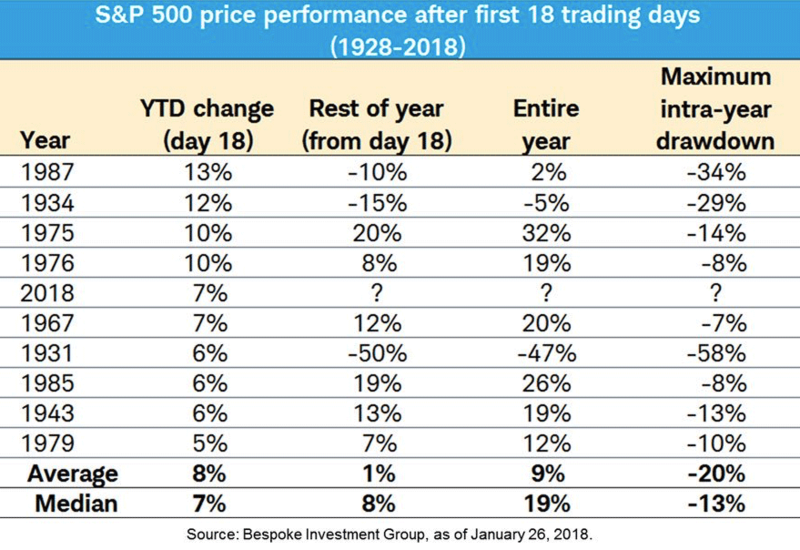 Strong starts to a year (like 2018) usually continue higher, but intra-year drawdowns are larger than in all other years. That makes sense, as the price has further to fall to revert to trend (from Bespoke). A week before the peak in US equities, optimism among retail investors reached a more than 3 years high, an extreme only matched twice during the current bull market: in January 2011 and November 2014. Investor optimism is a poor market timing tool but when price continues to rise, subsequent gains tend to be given back (arrows). So while it's impossible to know when the market will reverse, the reversal itself was not unexpected. But it would be wrong to say that the extent and speed of the fall in the past two weeks were easily anticipated. In only 9 days, the SPX and DJIA fell more than 10%. 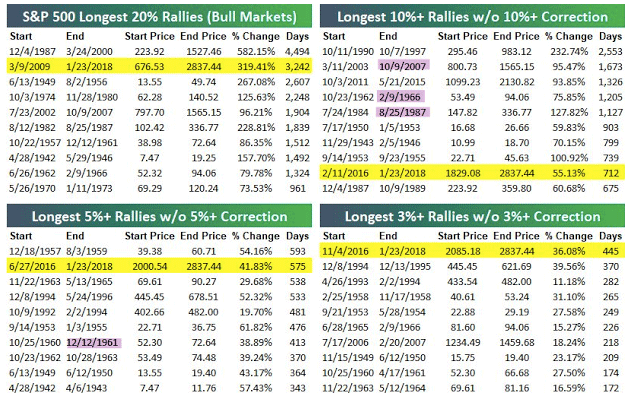 The last time a fall this large and fast occurred from an ATH was 90 years ago, in 1928. Recall that the SPX had set a record for the longest rise without a 3% fall, and that the current uptrend was one of the longest without a 5% fall or a 10% fall. In the past, there has been almost no overlap in streaks between 3% and 5% falls or streaks between 3% and 10% falls, meaning that long, calm uptrends tend to weaken in stages and over time. Yet within a few days, all of these streaks ended (from Bespoke). The quick reversal is not, in itself, bearish. Occurrences are few but in this small sample, equities recovered quickly. In 1928, for example, DJIA was 6% higher a week later and 18% higher after a month (from Sentimentrader). In 1955, SPX fell 11% in 12 days. It quickly rebounded to a new high in the next month (from Daniel Perczek). In 1980 and in 1986, SPX fell 9% within 2 weeks. In 1980, the high was retested in less than a month (and then equities fell into a bear market). In 1986, SPX double bottomed in the next 2 weeks and was at the prior high after about 2 months (from Quantifiable Edges). 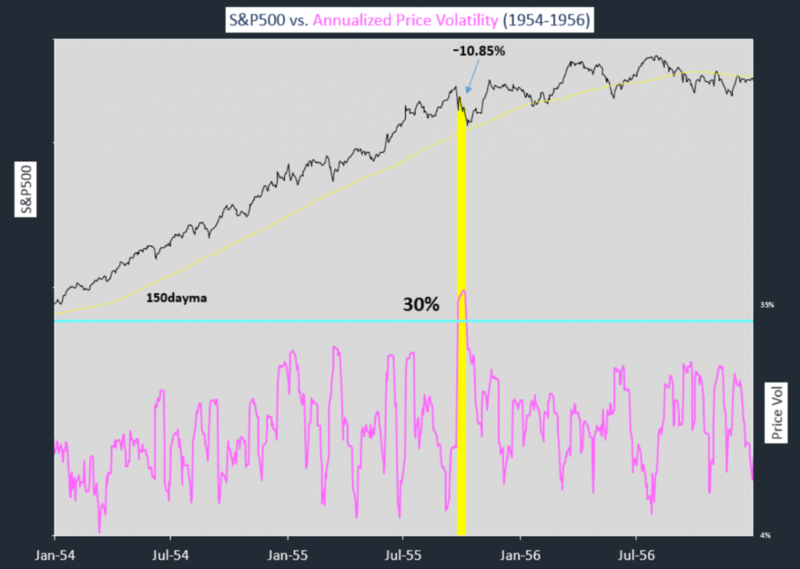 Recall that 1955 and 1986 were also periods when monthly RSI(14), a measure of momentum, reached an extreme present only two other times since, in 1996 and in January of this year. 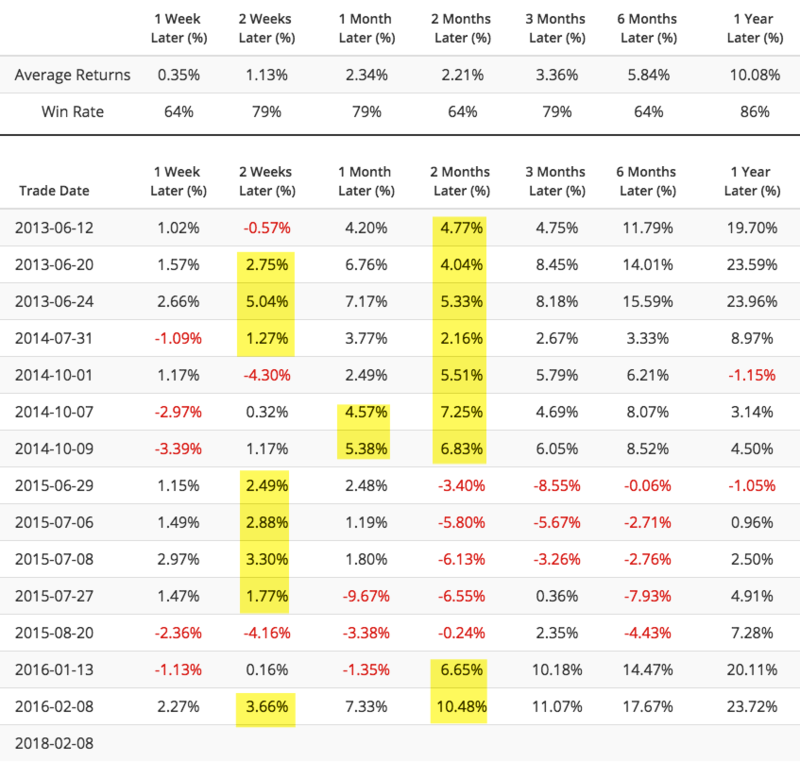 In our update two weeks ago, we showed that in all prior cases, SPX moved to new highs in the months ahead, but not before falling 11%, 5%, 6% and 9% in the next month. It's a small sample, but so far SPX is following the same pattern (that post is here). Those equities have quickly recovered from the previous swift falls that started from a high should not be a surprise. 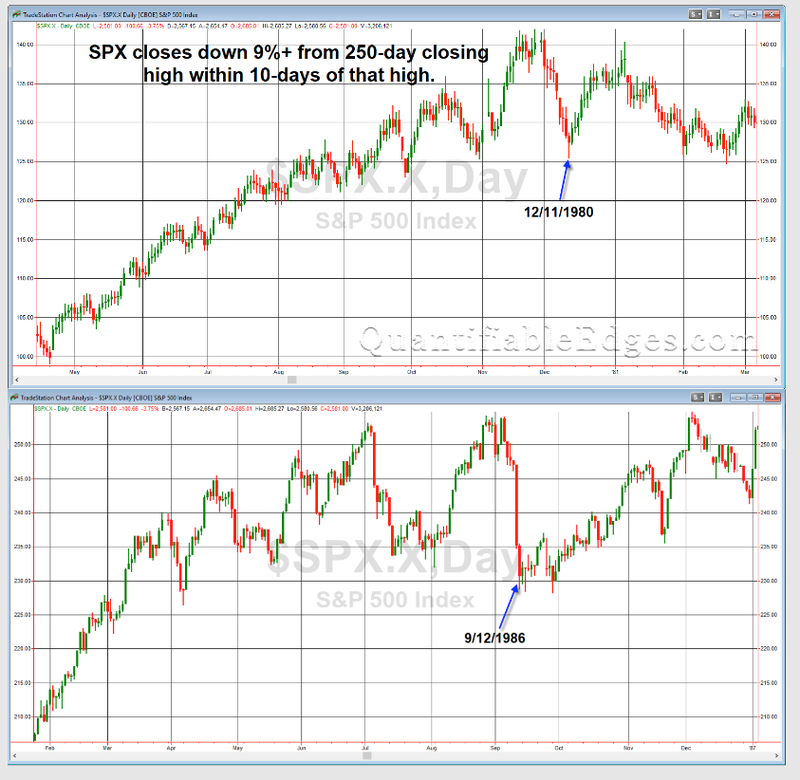 Strong uptrends carry the momentum that typically weakens before failing completely. The implication, however, is that for the first time since early 2016, the trend in equities is on watch. A recovery to prior highs followed by more volatility creates the sawtooth pattern that is most often found at important tops. To take a popular but extreme example, in 1987, SPX first fell 5% in March, recovered to new highs but then fell 9% in April and 7% in May. After another new high in August, SPX again fell 9%, recovered to within 2% of the top before crashing in October. What is now remembered as a sudden crash actually unfolded over the course of 6 months. SPX broke to a new low on Friday before bouncing over 3% into the close. It is now in an intermediate downtrend, as the price is under a flat 50-dma and a falling 13-ema. New uptrends start when price regains the 5-dma, which then flattens and then starts to rise (green line). 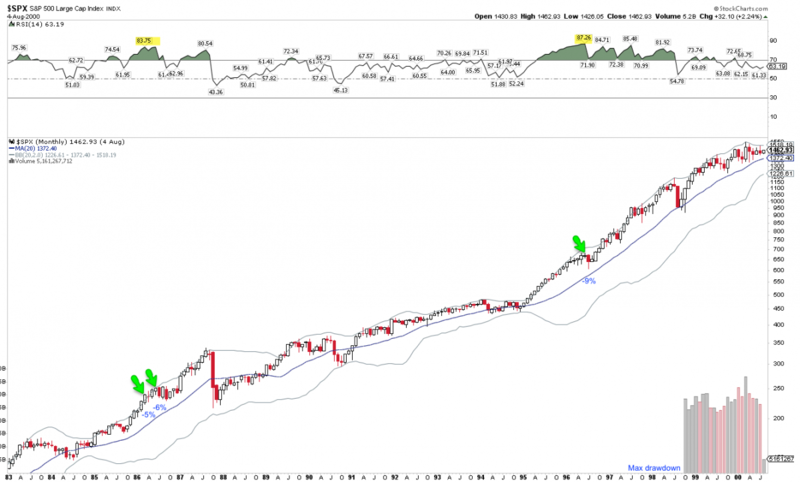 The rising 5-dma was supported on the rise and has been resistance since the late-January peak (arrows). The pivot points for next week are well placed. 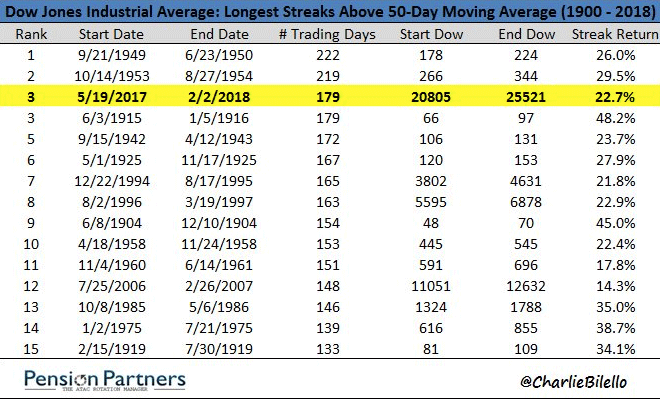 The break below the 50-dma this week ended one of the longest streaks in the DJIA's history. Notably, the end of prior streaks has never led directly to a bear market. So while the intermediate trend has turned lower, the likelihood of a much great fall in price is low (from Charlie Bilello). Breadth has washed out. Only 13% of the stocks in the SPX are above their 50-dma. Similar instances in the past 8 years are highlighted in yellow. Near-term risk/reward was heavily biased towards upside in all cases, although a low retest in the next month was common (arrows). 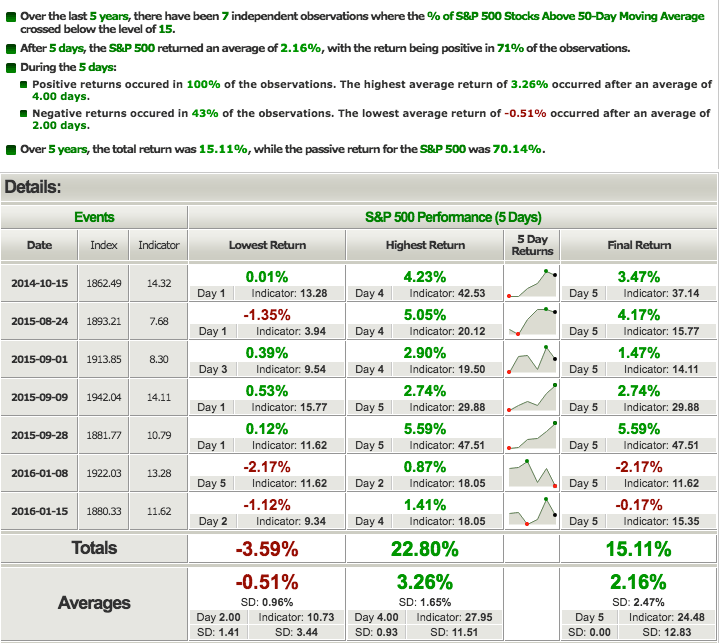 In the past 5 years, all similar instances gained within the next 5 days, with strong risk/reward (from Index Indicators). 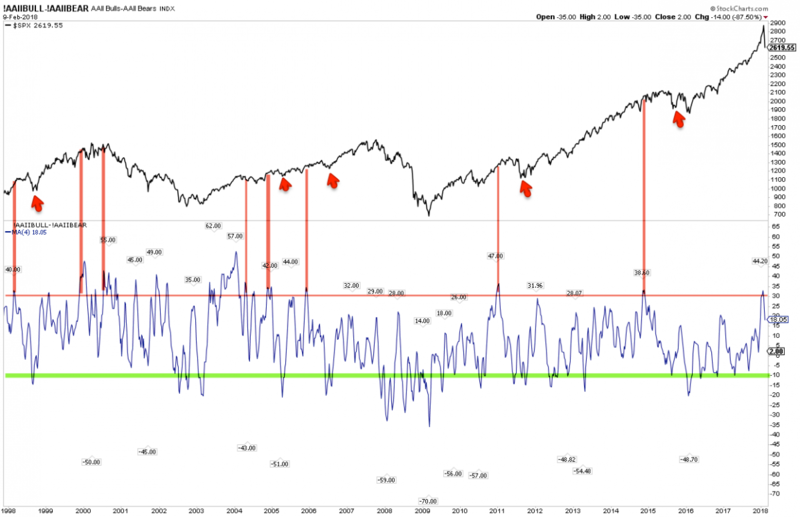 Similarly, the advance-decline percent over the past 10 days reached an extreme at the end of the week, the first such extreme since the last market correction in early February 2016. Risk/reward is biased higher but a low retest in the next month has previously been common (red highlights). Volatility indices spiked on the sell-off. 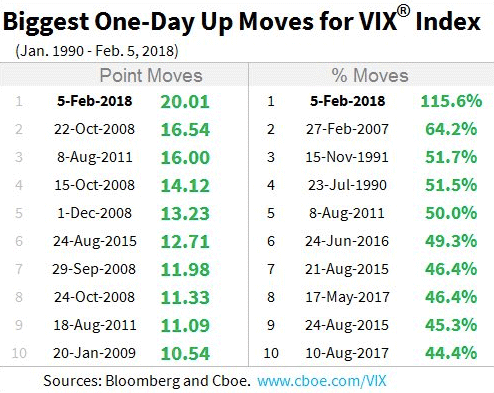 Measured in points or percent, the gain in VIX was the largest in its history (from CBOE). Similar spikes in VIX (measured relative to its 10-dma) have led to positive returns in SPX between 1 week and 4 weeks later every time. 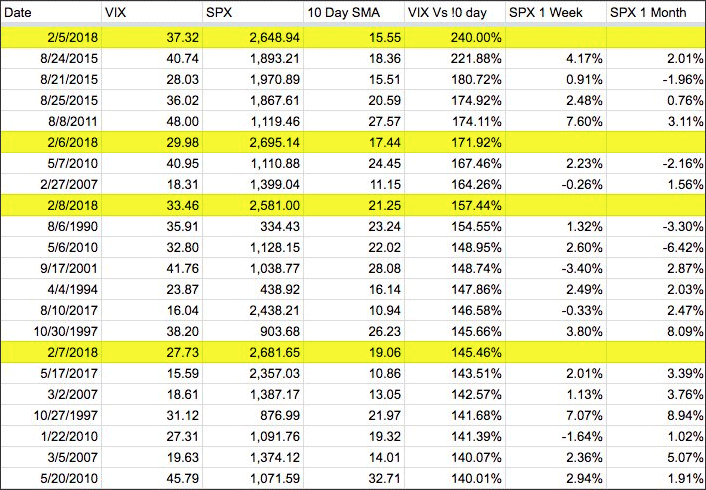 After one month, SPX was higher 78% of the time by a median of 2% (from Adam Warner). The premium of 1-month volatility to 3-month volatility spiked to the highest level since October 2008, the heart of the financial crisis. Similar instances since then are limited to just 3. SPX retested/exceeded the low in each case, but the interim bounce was 6-8%. It can take months for long-term sentiment to become bearish. 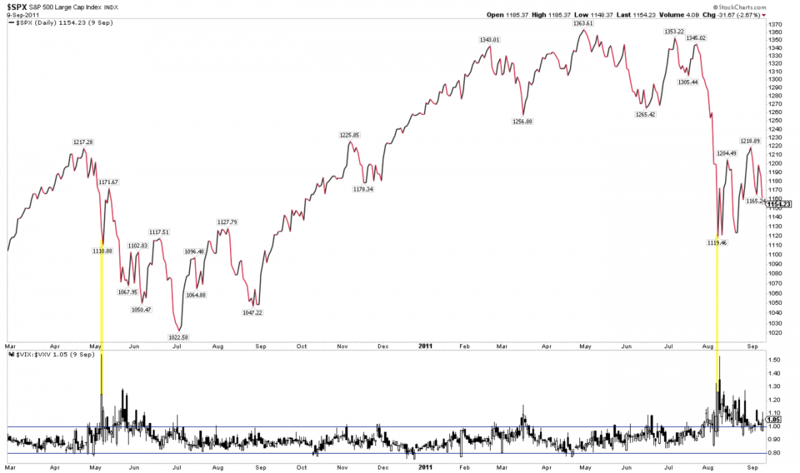 Looking at the AAII chart near the top of this article, note that it has taken at least 5 months to fully reset real investor sentiment after similar bullish extremes since the 2009 low. Investors become bearish through both price and time. Modest price falls that extend over several months wear out investors; a quick fall that just as quickly rebounds don't have time to fully reset investors' sentiment. This is a potential issue facing the market in the weeks and months ahead. 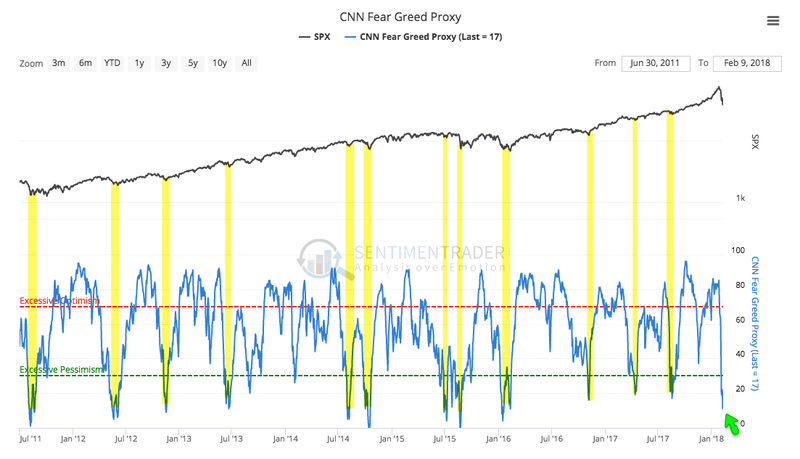 Yet the breadth and volatility studies shown above demonstrate that near-term sentiment has clearly turned bearish. 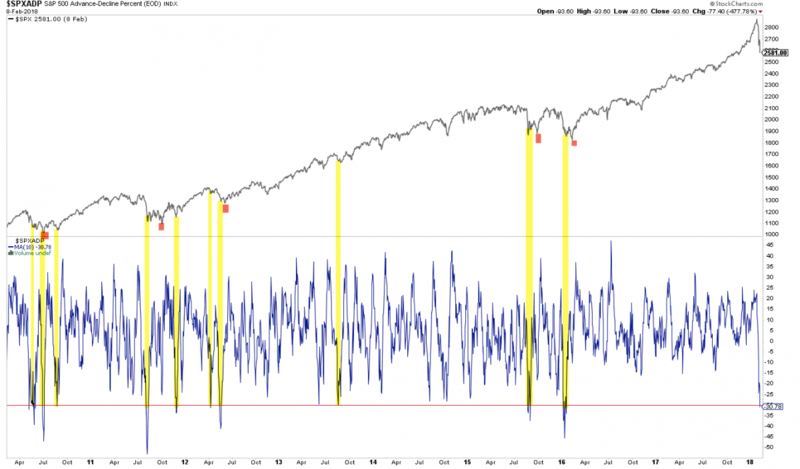 Investors have panicked in the past week, selling indiscriminately (breadth) and anticipating more volatility to come. 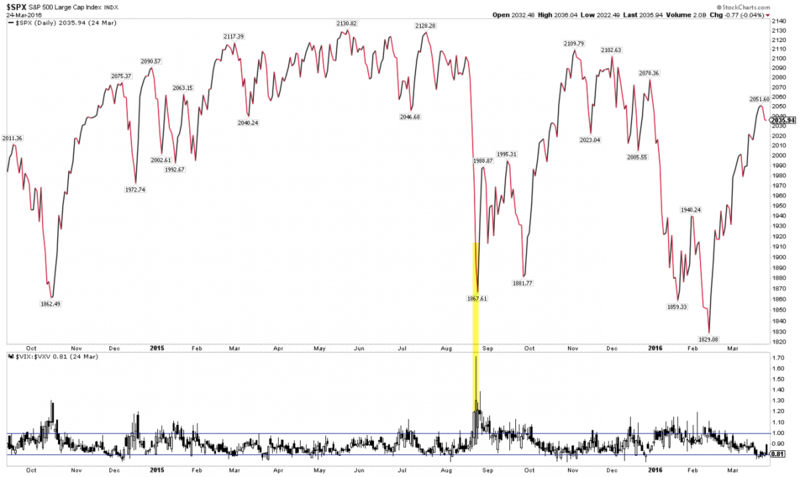 Daily Sentiment for SPX was over 90% bullish in early January. This week, it fell to 9%. Similar instances from 2012-16 are highlighted below. Again, risk/reward was strongly biased higher but note the high percentage of double bottoms (SPX in blue, DSI in red). 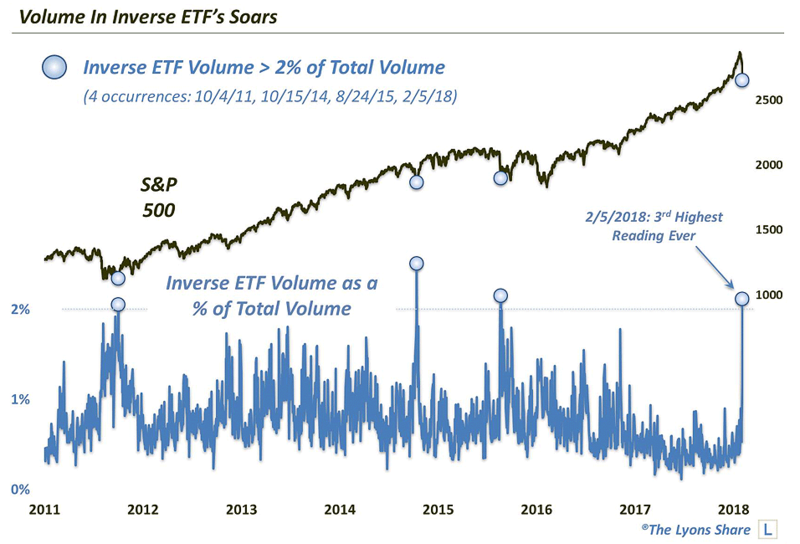 Investors have poured capital into inverse ETFs (which gain when the market falls). Prior instances are low but SPX has been heavily biased upwards in all cases (from Dana Lyons). The CNN Fear and Greed index dropped to 8 on Thursday. In the past 5 years, SPX has closed higher after 1 or 2 weeks 93% of the time (only August 2015 was a failure). SPX has also closed higher after 1 or 2 months 87% of the time (from Sentimentrader; to become a subscriber, please use this link). Fundamental data continues to be excellent. This week, initial unemployment claims fell to a fresh 45-year low. Historically, claims have started to rise at least 6 months ahead of the next recession. It's unlikely the recent swoon in equities is related to US growth prospects. Ten-year Treasury yields have gained nearly 50bp this year. 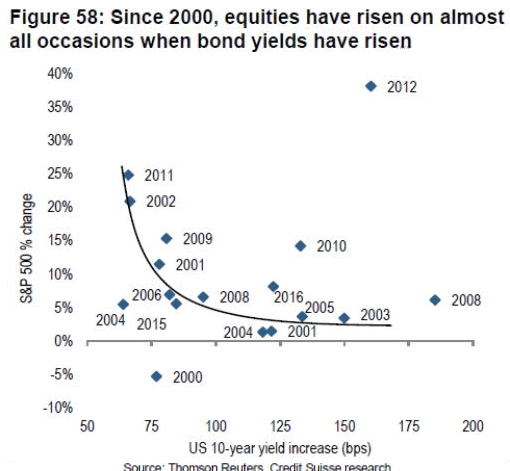 In the past 17 years, equities have gained in all years except one in which Treasury yields have risen, as rising yields reflect better growth prospects (from Liz Ann Sonders). That said, it's likely the rise in yields has become extended. 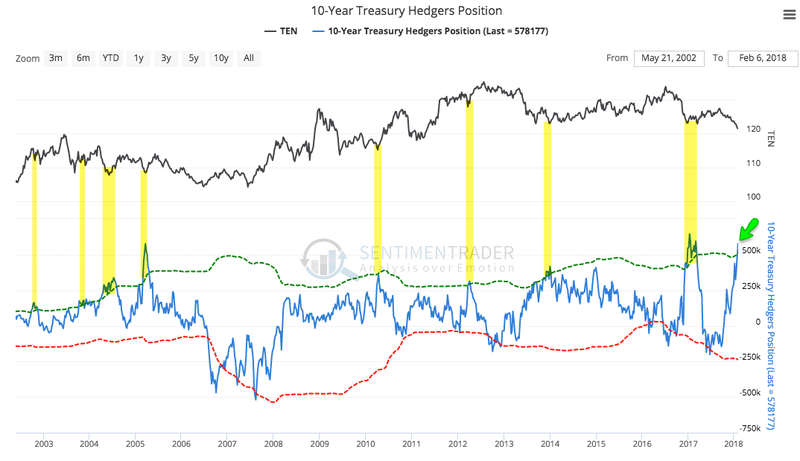 Commercial hedgers ("smart money" traders) have one their largest net long positions ever, meaning they believe yields will likely decline in the weeks/months ahead. Their track record is very good (from Sentimentrader). In summary, prior falls like the one suffered over the past two weeks have led to quick recoveries. That likelihood is further supported by a washout in breadth, volatility and several measures of sentiment. Moreover, the fundamental backdrop remains excellent. Risk/reward is heavily biased towards upside in the near term. That said, strong down momentum normally reverberates into the weeks ahead. Equities sometimes "V bounce" but more often form a double bottom. A low retest in the not too distant future remains a greater than 50% probability. On the macro calendar this week: retail sales and CPI on Wednesday, industrial production on Thursday and housing starts and permits on Friday. Friday is also options expiration.